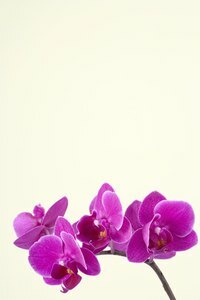 What Flowers Go With Orchids in Arrangements? Orchids are long-lasting, showy and sturdy. It shouldn't be a surprise that they're often used in floral arrangements, corsages and wedding bouquets. While they look dramatic all by themselves, combining orchids with other flowers doesn't have to be tricky. Keep a few basic pointers in mind. Flowers that grow together, go together in an arrangement. Pair orchids with other exotic tropical flowers. Other orchids in contrasting sizes and colors make a stunning arrangement. Other tropical flowers include ginger, antherium with broad bright "petals," protea with their round pincushion shape and crocosmia, which resembles freesias. Orchids are a formal flower. Use other flowers that are more formal as well, such as roses, peonies and calla lilies. Sprays of vandal orchids complement the blousy glamor of Oriental and Asiatic lilies. Gladiolus resemble orchids and give height to an arrangement. Because most orchids grow on stems that arch, straight-stemmed gladiolus give structure to an arrangement. When you think of orchids, you probably think of shades of purple and pink. However, orchids bloom in white, yellow, nearly red and shades of orange. Contrast or complement the color of the orchid with the other flowers. White orchids are set off by surrounding them with red roses. Cymbidium orchids in shades of green look spectacular when paired with bells of Ireland, green roses and green hanging amaranthus. Yellow orchids with bright orange center petals fit right in with red poppies and yellow snapdragons. Orchids grow in a myriad of sizes from tiny to the huge nearly 6-inches-across cattleya orchids. As with color, contrast or match the size of the orchid with the other flowers. Large flowers include lilies, hydrangeas, bearded iris and amaryllis. Medium flowers include roses, peonies, carnations and gerbera daisies. Small flowers include freesia, nerine, wax flowers and stock. Most of the time, orchids look odd with garden-variety informal flowers. Most gardeners don't grow orchids with their statice, larkspur and Shasta daisies. Break this rule by using flowers all in the same color and close to the size of the orchids. An all-white arrangement of vanda orchids, sweet peas, lisianthius and tulips combines the formality of the orchids with the whimsy of garden flowers.